After seeing so much of South America, Patagonia is still my favorite place. Incredibly vast, unbelievably diverse, and stunningly beautiful, it’s a region made of superlatives. But with high prices, unforgiving weather, and frustrating infrastructure, it’s not the easiest of destinations to navigate. A bit of planning and research goes a long way. Here are 10 things I wish I knew before visiting Patagonia. 1. Patagonia straddles two counties — should you visit one or both? Patagonia is shared across Argentina and Chile. There are mindblowing highlights in each country. It’s a great idea to experience both sides, but this will depend on how much time you have, onward travel plans, and your budget. The good news is that the former reciprocity fees for US and Canadian tourists (US $160) have recently been waived, so visiting both is cheaper than it previously was. If you have the time, you should definitely try to see as much as possible. A classic route is to fly into Buenos Aires, Argentina and out of Santiago, Chile, with domestic flights to take you to and from regional airports in Patagonia. 2. And if you cross those borders, be aware of what you’re carrying. This may sound really obvious, but if you’re not used to land-border crossings, it can be easy to board a bus forgetting that you’re heading to another country. And, depending on your route, you may cross the border several times between Chile and Argentina. Chile, in particular, is very strict with their border controls. You’ll go through a thorough screening process to keep invasive species out, to protect their fragile flora, fauna, and agricultural industries. As travelers, it’s normal to stock up on snacks for long journeys, but make sure you consume anything that isn’t permitted before you get to the border, like meat, fruit, and dairy products. I saw a Russian couple receive a hefty fine (and delay our bus by 40 minutes) crossing into Chile because of a forgotten apple at the bottom of a backpack. 3. Visit during the summer… no, the “other” summer. Remember that the seasons are reversed in the southern hemisphere, so it’s best to visit Patagonia during South America’s warmest months, from late November to March. You don’t have a lot of choice with this — many tour operators, hostels, and even some bus routes only operate in the summer. And with good reason — many of the trails are closed, or reserved only for professionals, and sometimes the snow can completely cut off access to towns. But you can try traveling in the shoulder season — October and April-May, when prices are slightly better, and the region is less crowded with tourists. But you’ll need to check in advance to see what’s open and accessible. 4. Patagonia is expensive — budget carefully. There’s so much to do and see, and accommodation and transport, even by bus, are expensive. Then there’s the myriad excursions available, from kayaking alongside glaciers to visiting Magellanic penguins on remote islands. So, if you’re traveling on a tight budget you need to plan carefully and prioritize. Luckily, there are always ways to save money. In the town of El Calafate, we discovered that if you have more than two people, it can be cheaper to rent a car for the day ($50 USD) to visit Perito Moreno glacier, rather than taking the expensive bus tour. The lodges in Torres del Paine National Park are eye-wateringly expensive, but they also offer camping pitches which are cheaper if you bring your own tent, and some campsites in the park are actually free (but fill up quickly!). While Torres del Paine has a hefty park entry fee, the equally stunning Parque Los Glaciares, just over the border in Argentina, is totally free. In towns, a great tip is to book hostels with open kitchens and cook a few meals yourself to save money on eating out (which is also really expensive). Saving money on food helped me justify splashing out on some unforgettable excursions like ice-trekking on Viedma glacier. 5. Be prepared for slow travel — everything in Patagonia is far apart. Take a look at a map — Patagonia is HUGE. The region covers over a million square kilometers, which is three times the size of Germany, but with only 2 million inhabitants (Germany has a whopping 82.7 million people). So much of the region is devoid of civilization, so it should come as no surprise that it can be hard to travel around. Plan your itinerary carefully, giving lots of time for long overnight buses to get from one place to another. I took a bus from Bariloche to El Chalten, both on the Argentinian side, which was an epic 24-hour journey. Yet when you look at a map, the distance covered is dwarfed by the immensity of Patagonia. Some internal flights are available, but they’re pricey. 6. Build rest/planning days into your schedule. I always try to pack as much as possible into my itinerary, but you can’t underestimate how much you’ll need to sort out on the ground. You’ll need time to find bus companies to book your onward travel, accommodation, compare and book excursions with local tour operators, do laundry, stock up on food, and just relax (recover from that bus journey) before heading out to explore the area. There’s so much that can’t be found online like up-to-date bus schedules, so you also have to be prepared to discover that the bus you need only runs twice a week, and be flexible with your schedule when necessary. 7. But some stuff does need to be booked in advance. The top attraction on the Chilean side of Patagonia is the Torres del Paine National Park. On offer are some stunning scenery and many hiking routes, including the popular W-trek (5 days) and O-circuit (8 days). If you’re planning to hike through Torres del Paine National Park, whether you’re camping or staying in lodges, you must book your accommodation in advance — they won’t let you start the trail unless you have something reserved. In the high season, the lodges get booked over a month in advance, so it’s a good idea to base your travel in Patagonia around this and get it booked early. 8. You’re going to do a LOT of hiking — make sure you’re ready. Obviously, this depends on your travel style, but a lot of the amazing sites in Patagonia require some effort to get to them. Yes, you can just step off a bus and see Perito Moreno glacier without hiking, but for many of the other top attractions like the famous towers of Torres del Paine in Chile or Mount Fitz Roy in Argentina, some serious graft is involved. Make sure you’re prepared. Don’t rock up with brand new hiking shoes, or realize your pack is too heavy just an hour into a four-day hike. Think carefully about what gear you need, or don’t need — tents, camping stoves, food, clothing — there’s a lot to think about. Do some practice hikes at home to get yourself used to hiking with all your gear — it will make the experience immensely more enjoyable. 9. Be prepared for extreme weather. The unpredictable weather is kind of a cliché of Patagonia — but it’s true. You can experience all four seasons in the space of an afternoon. Pack layers for easily adapting to the changing weather around you — from shorts to winter gear, and always be prepared for the rain and high winds at a moment’s notice. Then there’s the sun. The ozone layer is particularly thin over Patagonia, making the UV index really high. Protect yourself with hiking clothes made with UV-protective fabrics, and by wearing a hat and plastering on the sunscreen. 10. Be an environmentally conscious traveler. Patagonia is all about the beautiful natural surroundings. With thousands of visitors each year, we all have a responsibility for keeping it that way, so think carefully about the impact of your visit and how you can mitigate it. For remote national parks, waste disposal is a big issue. Take a reusable plastic bottle which you can refill in streams and pack out all of your trash. Respect park rules about lighting fires. 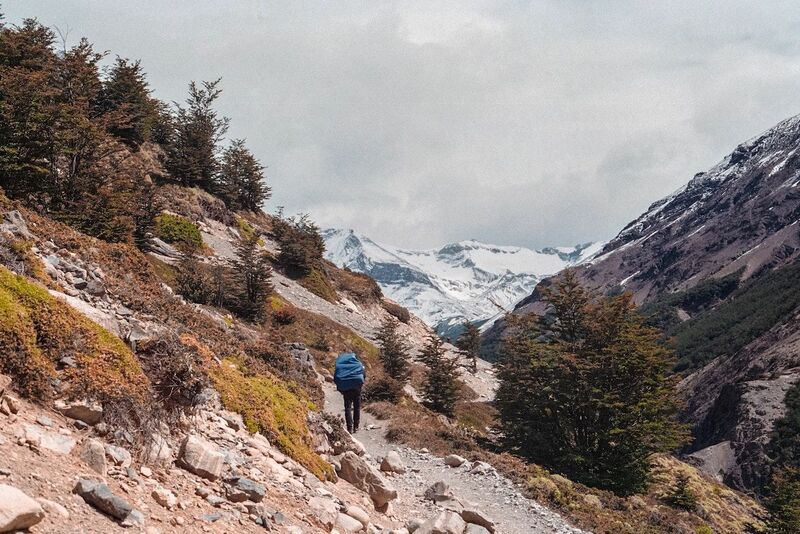 Forest fires started by hikers have had devastating consequences in Patagonia over the last decade. Stick to the paths to avoid trampling on delicate plants and causing soil erosion. There are loads of blogs out there with advice on how to be an environmentally-conscious traveler — so make sure you’re one of them!